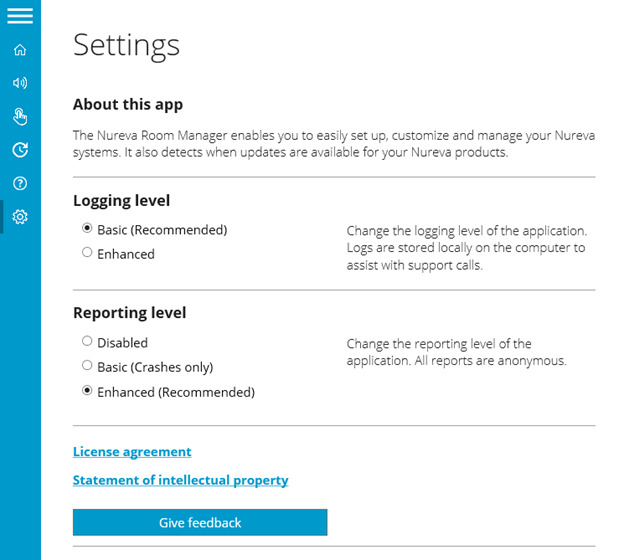 Nureva Room Manager is an application installed on the computer connected to your Nureva Wall or HDL300 audio conferencing system. The app provides system configuration steps and options, and it also detects when firmware and software updates are available. 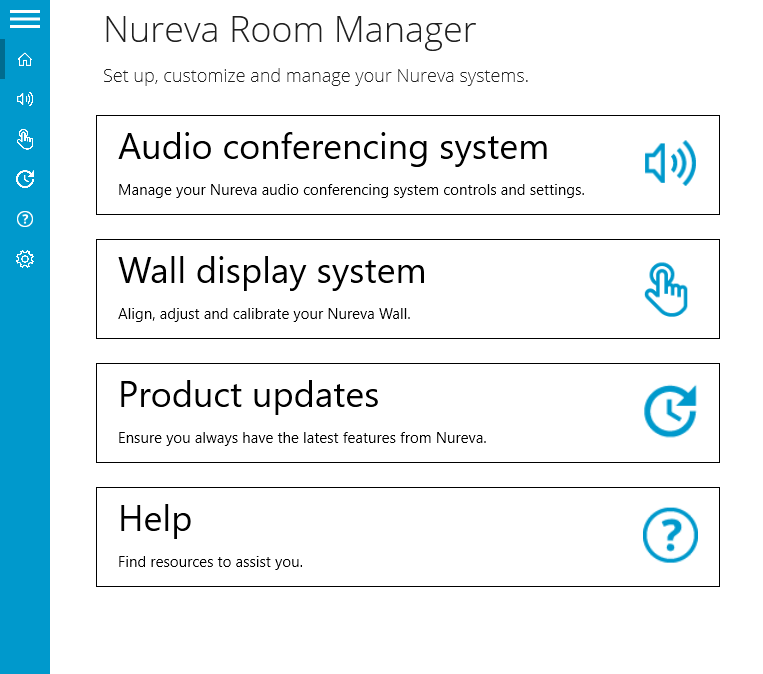 Download and install Nureva Room Manager from the Nureva downloads page. By default, Nureva Room Manager will launch once the installation is complete. The application will run in the background and will appear when you click the Nureva Room Manager icon in your Windows® taskbar. Tile(s) for the related Nureva system will only appear on the home page when Nureva Room Manager detects that the system is attached to the PC running Nureva Room Manager. The Controls section provides options to check and customize the communication settings for the HDL300 system. *The Controls settings are only available for HDL300 fimware 1.8 or higher. To learn how to update your HDL300 firmware, see Product updates. Microphones Adjust the input volume for the HDL300 microphones. Additionally, set the microphone pickup to mono or stereo. Speakers Configure the output volume, treble and bass settings for the HDL300. Also, set the speaker output to mono or stereo. The speakers should play a series of chimes over both speakers that vary in tone, volume, and speaker channel (left vs. right). If there is no speaker output, or only one channel plays, recheck the system wiring and the software settings for the playback (output speaker) device. Auxiliary ports Configure the auxiliary ports to get the most from your external devices. See the Using the auxiliary ports article for more details on the auxiliary settings. Audio processing Initiate Fast calibrate for the system to immediately calibrate the settings to fit the space. The echo reduction and noise reduction options are currently not offered at this time and will appear grayed out. Optionally, click Back up current settings to store the settings once the changes have been made. Use this option to reset your device to original factory settings. Restore the last saved settings, overwriting any changes made after the last time Save was clicked. The System information page provides information about your specific system and software, such as identification numbers and firmware version. 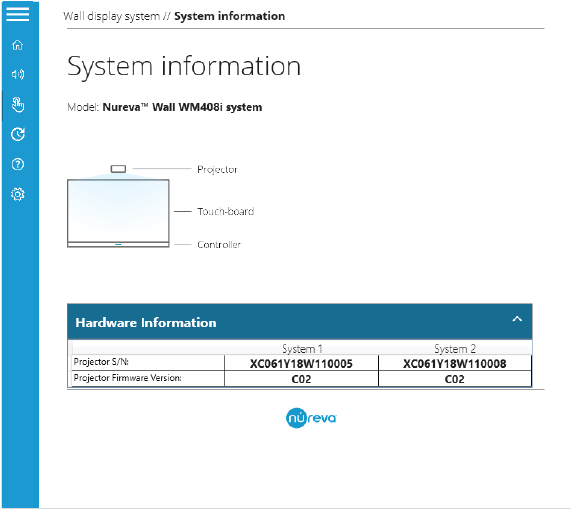 The Wall display options consist of tools for setting up touch on your Nureva Wall. The system matching process pairs which projector goes with which touch panel. Tap the touch panel when the words "Touch to match this display" appear. The image alignment process digitally aligns the image to lie just inside of the touch panel's bezel. Touch and drag the handles on the projected image until the image is aligned with the inner edge of the touch panel's bezel. Touch calibration is required to map touch events with your aligned image and requires a nine-point, manual calibration procedure. Touch and dwell on each location in sequence, moving to the next target when the target turns solid blue. There is an audio chime for additional feedback at each successful target calibration, as well as a final chime to indicate the overall calibration has been stored on the host PC. Activate Wall features, such as presence detection, in the controls page. To enable presence detection on your Nureva Wall, toggle the motion detection switch to On. This feature not only conserves power, but also helps get meetings started quickly. The presence detector can sense movement up to 16 ft. (5 m) away from the sensor and will turn the system on when it detects movement. For more information, see our about presence detect article. Use the slider to set how long the system will be on before it goes into sleep mode. The System information page provides information about your specific system and software, such as serial numbers and firmware version. You will need this information when calling Nureva Support if you encounter any issues with your system. The updates page alerts you once any updates to your system are available. If automatic updates is turned on, any firmware updates will be installed automatically whenever Nureva Room Manager is started up. Room Manager software updates must be initiated manually when a new update is available. Update notifications can be seen on the icon in your system tray or in the Room Manager updates page. The system will notify you when there is an update available for either the system firmware or Nureva Room Manager software. If there is a new update available, an Update now button will appear along with a link to the release notes. Click the button to initiate an update. Click Begin update. A progress status bar will appear. The update typically takes about 30 seconds, depending on your internet connection. Nureva Room Manager will restart once the update is complete. Turn on the Auto update toggle to set Nureva Room Manager to automatically update your HDL300 system's firmware when Nureva Room Manager starts up. The Auto update feature will only enable automatic firmware updates. 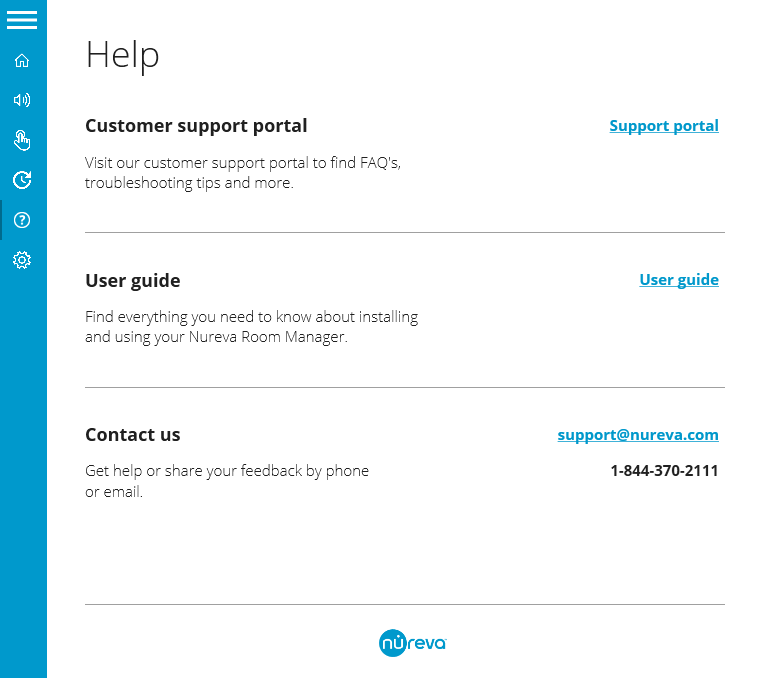 The Help page provides links to resources such as the customer support portal, the user guides and a contact email to reach Nureva support. On the Settings page you can activate Room Manager's logging and reporting features. The logging feature stores logs for Room Manager's activity locally on the system's computer. These logs can be shared with IT or Nureva Support for troubleshooting the system. Enhanced – Logs every action done by Room Manager. Should only be turned on for short periods of time for troubleshooting purposes. Reporting tracks user behavior, including the initial setup of the system and day-to-day usage. All reports are anonymous and help Nureva better understand how to improve their products.